Endocrine-cerebro-osteodysplasia (ECO) syndrome is a recessive genetic disorder associated with multiple congenital defects in endocrine, cerebral, and skeletal systems that is caused by a missense mutation in the mitogen-activated protein kinase-like intestinal cell kinase (ICK) gene. In algae and invertebrates, ICK homologs are involved in flagellar formation and ciliogenesis, respectively. However, it is not clear whether this role of ICK is conserved in mammals and how a lack of functional ICK results in the characteristic phenotypes of human ECO syndrome. Here, we generated Ick knockout mice to elucidate the precise role of ICK in mammalian development and to examine the pathological mechanisms of ECO syndrome. 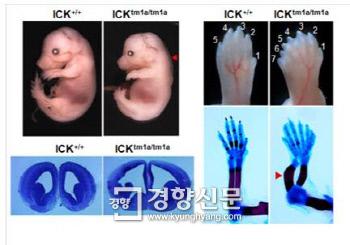 Ick null mouse embryos displayed cleft palate, hydrocephalus, polydactyly, and delayed skeletal development, closely resembling ECO syndrome phenotypes. In cultured cells, down-regulation of Ick or overexpression of kinase-dead or ECO syndrome mutant ICK resulted in an elongation of primary cilia and abnormal Sonic hedgehog (Shh) signaling. Wild-type ICK proteins were generally localized in the proximal region of cilia near the basal bodies, whereas kinase-dead ICK mutant proteins accumulated in the distal part of bulged ciliary tips. Consistent with these observations in cultured cells, Ick knockout mouse embryos displayed elongated cilia and reduced Shh signaling during limb digit patterning. Taken together, these results indicate that ICK plays a crucial role in controlling ciliary length and that ciliary defects caused by a lack of functional ICK leads to abnormal Shh signaling, resulting in congenital disorders such as ECO syndrome. 1H.M. and J.S. contributed equally to this work. 2To whom correspondence may be addressed. Author contributions: H.M., J.S., J.-O.S., H.L., H.-K.K., J.B., and H.W.K. designed research; H.M., J.S., J.-O.S., H.L., and H.-K.K. performed research; H.M., J.S., J.-O.S., H.L., H.-K.K., J.B., and H.W.K. analyzed data; and H.M., J.S., J.T.E., J.B., and H.W.K. wrote the paper. 태아의 신경계·내분비계·골격계 기관 형성에 심각한 장애를 가져오는 선천성 희귀유전질환인 ‘ECO 증후군’의 발병 원인이 국내 연구진에 의해 규명됐다.